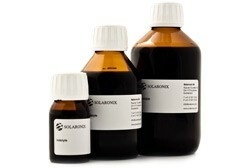 The equivalent of Mosalyte TDE-250 but with a lower iodide concentration especially suited for low-light applications. Solar cells prepared with Mosalyte TDE-025 can exhibit exceptional stability and very long lifetimes. This electrolyte is best used with TiCl4 treated titania electrodes for high performance. The research leading to this product has received funding from the European Union Seventh Framework Programme (FP7/2007- 2013) under grant agreement n° 315131, FP7-SME-2012 , Project ADIOS-Ru.